Financial Aid services administer a number of state and federal financial aid programs to help Union County College students meet their college expenses. Financial aid awards include grants, scholarships, loans, federal work study, or any combination of these. All communication to students concerning financial aid is sent to their Union County College email, and students are responsible for checking their email regularly. Although the financial aid staff makes every effort to inform students of financial aid guidelines, the ultimate responsibility for complying with federal aid regulations is that of the student. Financial aid awards are based on need. Students are encouraged to apply for financial aid before April 15 to be considered for the maximum eligibility. 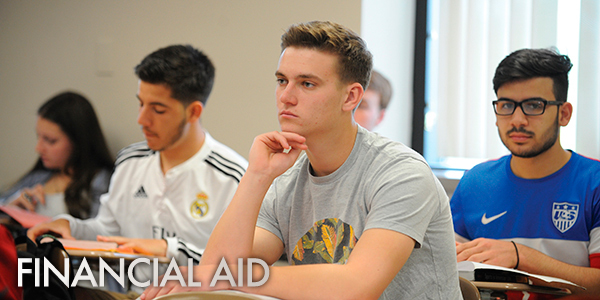 Applying for financial aid is simple. You will need to complete only two forms to apply for all federal and state scholarships and grants, federal loans, federal work study, and all institutional scholarships. Full and part-time students are eligible for financial aid although some forms of aid will be adjusted if you are less than full-time. Your first step is to complete the FAFSA (Free Application for Federal Student Aid) at www.fafsa.gov. Remember to enter the school code of 002643 for Union County College so we receive your FAFSA electronically. You will need to apply for a Personal Federal Student Aid ID (FSA-ID). If you are a dependent student both you and one parent will need to apply for separate FSA-IDS and you will use the FSA-IDS to electronically sign your FAFSA. You and/or your parents must complete their federal tax return. While completing the FAFSA on-line, you will import your and/or your parents’ federal tax information from the IRS using a secure data retrieval tool (DRT). Once you reach the Web confirmation page, locate the link entitled “Optional Feature - Start your State Application.” Respond to the questions for you and/or your parents and submit the additional information to the State of New Jersey. Once you have submitted your FAFSA, you should also complete the Scholarship Application. This is the application for all scholarships. Last year, we awarded hundreds of institutional scholarships to our students. If you are interested in applying for the Scholarship, please log into your Owl’s Nest portal (need to login), and click on the Scholarship application link on the left hand side. Once you have submitted your FAFSA, the U.S. Department of Education will process your FAFSA and send a copy to you in the form of a Student Aid Report (SAR). Your SAR will be sent to you electronically if you listed an email address on your FAFSA. Please review your SAR and notify our office if you made any mistakes. We will walk you through how to correct them. Verification: The U.S. Department of Education randomly selects FAFSA submissions (FAFSA) for further review. Students selected are notified by the U.S. Department of Education and by email from the Union County College Financial Aid Services account. If selected for Verification, students must submit documentation (i.e., tax, return, transcript, verification worksheet, etc. ), and a review is conducted by Financial Aid Services. If errors are found, the financial aid staff must submit corrections to the U.S. Department of Education. This may decrease the estimated award, and the student will be liable for the balance. Verification must be completed prior to receiving payment of any federal grant, loan, or state awards. Failure to submit the required documentation will result in the denial of all federal and state financial aid including student loans. The U. S. Department of Education will also send your information to all of the colleges listed on your FAFSA, as well as to the New Jersey Higher Education Student Assistance Authority (HESAA). You will receive a Student Eligibility Notice (SEN) once your eligibility for state grants is determined. All communication from the Financial Aid Office is in an electronic format. This means, as a Union County College student, it is essential to check Web Services to view your financial aid status and/or any documents required to complete your financial aid application AND to check your Owl’s Nest email account daily because all communication we send to a student is sent through your Owl’s Nest email. A Free Application for Federal Student Aid (FAFSA) must be completed each year and it serves the entire academic year (Fall, Spring, and Summer terms). The FAFSA becomes available each October for the following fall semester and remains available through the following summer. We recommend that you complete your FAFSA as soon as possible. To expedite the accessibility of federal student aid, which includes federal grants, loans, and work-study opportunities, new regulations require students and parents to use their 2016 tax returns for the 2018-2019 academic year. If you previously received a Tuition Aid Grant (TAG) you will need to complete your FAFSA by April 15, 2018 in order to be considered for the grant in the next academic year (2018-2019). For more information on state grants, please visit the website for the State of New Jersey Higher Education Student Assistance Authority (HESAA) at www.hesaa.org. Certain funds are available on a limited basis; therefore, it is in your best interest to apply as early as possible. Be accepted as a student in an eligible certificate or associate degree program. Be making satisfactory academic progress for financial aid purposes. Have a high school diploma, General Education Development (GED) certificate, or a secondary school completion credential for home school. Be a U.S. citizen or eligible non-citizen (this includes permanent resident status). Register with Selective Service if required. Not be in default on a previously awarded student loan or owe a refund on a previously awarded grant. Different forms of financial aid may have additional eligibility criteria. Below is the estimated cost of attending Union County College for an average full-time student (12 credits) for one year (2 semesters). The total amount is used to determine financial aid awards based on the student’s eligibility index. Amounts are subject to change. Union County College offers many types of financial aid from federal, state, and institutional sources to help you fund your education. Below are some of those types of financial aid. The information below includes grants, scholarships, loans, and work study. All aid is subject to available federal, state, and institutional appropriations. Federal Pell Grant - The Higher Education Act of 1972 established this grant program to provide aid to financially needy students attending college. Students must meet eligibility requirements and must be pursuing a degree program or eligible certificate program. Students attending more than one institution in an award year may only receive a Pell grant at one school. The maximum federal Pell grant for the 2017-2018 academic year is $5,815 depending on your financial need. This grant may be adjusted based on changes in the number of credits that you register for in a term. Federal Supplemental Educational Opportunity Grant (SEOG) - This program awards funds to undergraduate students with the greatest need. If you are a Pell Grant recipient with the lowest expected family contribution (EFC), you will be considered first. Just like Pell grants, the FSEOG does not have to be repaid. Most awards range from $100-$300, on a first-come, first-served basis. Federal Work Study - The Federal Work-Study Program provides employment opportunities for students who need additional funds to help meet their educational expenses. To be considered as a candidate for the work-study program, a student must (1) file a FAFSA, (2) be a U.S. citizen or permanent resident, (3) be enrolled in an undergraduate academic program, (4) be registered for at least six (6) or more credits, (5) meet the financial aid standards of satisfactory academic progress, and (6) be in good academic standing. Federal Direct Loans - Union County College participates in the William D. Ford Federal Direct Loan Program, commonly known as direct lending. The College’s participation in this program allows students to borrow directly from the U.S. Department of Education. The Direct Loan program enables eligible applicants and their parents to obtain a student loan (Subsidized or Unsubsidized) or parent loan (PLUS) to meet their educationally related expenses. * With a first disbursement date after July 1, 2017. ** Interest rates are subject to change after July 1, 2018. For application instructions, please go to the Financial Aid page on the College’s website, www.ucc.edu. Please review the studentaid.gov website for up-to-date interest rates. To receive funds from the State of New Jersey, students must register for a minimum of six (6) credits each semester. Academic progress regulations are the same as the federal regulations. Progress is monitored at the end of each semester. Tuition Aid Grant (TAG) - The Tuition Aid Grant provides financial assistance to full-time college students or part-time students (enrolled for at least 6 credits) who have been residents of New Jersey for twelve (12) consecutive months prior to enrollment. To be considered for an award, a student must complete a FAFSA and a Tuition Aid Grant Application. The TAG application can be accessed after the student has submitted his/her FAFSA or by going to the Higher Education Assistant Authority website, www.hessa.org. Governor’s Urban Scholarship Program - The Governor’s Urban Scholarship is a merit award available to students who rank in the top 5.0 percent of their high school graduating class and attain a grade point average of at least 3.0 at the end of the junior year in high school, file a FAFSA within established deadlines, and have a New Jersey Eligibility Index below 10500. To qualify, applicants also must graduate from a traditional public, public charter, county vo-tech, or nonpublic school, and reside in Asbury Park, City of Camden, East Orange, Irvington Township, Jersey City, Lakewood, Millville, Newark, New Brunswick, City of Trenton, Paterson, Plainfield, Roselle Borough, or Vineland. NJ STARS - This merit-based program is offered to students who at the end of either their junior or senior year are within the top 15% of their New Jersey high school graduating class. The scholarship may cover all or a part of the student’s tuition and fees. For more information, go to www.njstars.net. Educational Opportunity Fund (EOF) - Instituted and sponsored by the State of New Jersey, the Educational Opportunity Fund is an academic support program providing access to higher education for students who show potential but who need additional support services and financial aid to succeed academically. All students accepted into the EOF Program must be pursuing a degree, be residents of the State of New Jersey for at least one year, meet all program requirements, and be citizens or permanent residents of the United States. Union County College offers a wide variety of scholarships to help you achieve your educational goals. Last year, Union County College awarded hundreds of scholarships to our students. Scholarships are a form of financial aid that does not have to be repaid. Each scholarship has different criteria and there are scholarships available for many students. Scholarship selection can be based on GPA, major, high school, city, community service, and other criteria. The Scholarship Application is the application for all of these scholarships. Some scholarships require that you complete the Free Application for Federal Student Aid (FAFSA) in order to be eligible. For more information, please view the Scholarships page of the Financial Aid website. Know the terms, conditions, and pay rate for any student job you accept under the Federal Work Study Program. Appeal any decision with the Financial Aid Office in regard to your application. Appeals should be filed no later than 30 days after the original notification that you have been denied aid. Complete your FAFSA each year at least 4 months prior to the semester that you will be attending. New Jersey residents must meet all deadlines set by the New Jersey Higher Education Student Assistance Authority (HESAA). Deadlines can be found at www.hesaa.org. You must not owe a refund on any Federal Aid. Provide additional documentation, federal tax transcripts, W-2’s, and any additional information if requested by the Financial Aid Office or HESAA. Be sure to provide the information to the office that requested it. Complete the registration process each semester by the start of the semester in order to ensure availability of all student aid funds you have been awarded. Know the implications that dropping a course or withdrawing from Union County College will have on your student financial aid. Report private sources of student financial aid to the Financial Aid Services within the Student Services Center. Please submit a copy of your outside scholarship award letter to the Student Services Center. Keep your local and permanent addresses current with the Admissions Office. For Direct Loan borrowers, when you graduate or withdraw from school, remember to complete exit advising at www.studentloans.gov in order to obtain valuable information about repaying your loans. All students receiving financial assistance must attend classes regularly. The term “Title IV Funds” refers to the federal financial aid programs authorized under the Higher Education Act of 1965 (as amended) and includes the following programs: Unsubsidized Direct Loans, Subsidized Direct Loans, Direct Plus Loans, Federal Pell Grants, and Federal SEOG grants. the midpoint of the semester for a student who leaves without notifying the institution. Title IV is prorated based on the number of days attended up to greater than the 60% point in the semester. Title IV aid is viewed as 100% earned after that point in time. Notices of possible refunds and adjusted bills will be sent to the student’s home address following withdrawal. Providing each student with the information given in this policy. Identifying students who are affected by this policy and completing the Return of Title IV Funds calculation for those students. Returning any Title IV Funds that are due the U.S. Department of Education Title IV programs. Students are responsible for the balance of unearned Title IV Aid that was disbursed directly to the student and in which the student was determined to be ineligible for via the Return of Title IV calculation. Federal regulations require all financial aid recipients to maintain satisfactory academic progress in a course of study leading toward a degree or certificate. Failure to meet one or more of the established standards of Satisfactory Academic Progress (SAP) will make a student ineligible for financial aid. Financial aid SAP status includes all previous academic history, even if the student did not receive financial aid. Statuses are updated at the end of each semester, including summer. It is the student’s responsibility to monitor academic progress. Although the Financial Aid Services notifies students of their status, students who do not meet the standards will be ineligible for financial aid even if they do not receive correspondence. Grade Point Average (GPA): Students must maintain a 2.0 cumulative GPA on all hours attempted at Union County College. Completion Rate: Students must complete 67% of all hours attempted at Union County College. See below for how the percentage completion is calculated. Maximum Time Frame: Students receiving financial aid must complete their program of study within a reasonable time frame. The maximum time frame to complete a program is 150% of the published length of the academic program or certificate (including all transfer credit hours). Financial Aid Warning - The first time that a student fails to meet the SAP standards of a cumulative 2.0 GPA, 67% completion rate, or maximum time frame, he or she will be placed on financial aid warning status and be notified of their status. The student will remain eligible for financial aid for one semester while on warning. If a student fails to meet the SAP standards of a cumulative 2.0 GPA and 67% completion rate after being placed on financial aid warning status, then he or she will no longer be eligible for financial aid. Exceeds Maximum Time Frame: If a student fails to meet the Maximum Time Frame standard, then he or she will no longer be eligible for financial aid. Failure to meet one or more of the established financial aid standards of satisfactory academic progress will make a student ineligible for financial aid. Those students will be responsible for payment of their own tuition and fees. Satisfactory Academic Progress Appeal: When a student loses financial aid eligibility because he or she failed to make satisfactory progress, the student may appeal that determination on the basis of: injury or illness, the death of a relative, or other extenuating circumstances. An appeal submitted by a student must explain why he/she failed to make satisfactory progress and what has changed that will allow the student to make satisfactory progress at the next evaluation. The appeal along with the Educational plan will be evaluated on an individual basis to determine if the student has demonstrated why they were unable to meet the standards. Successfully complete ALL courses attempted. A student who meets the above requirements of the Educational plan can have the probation status continued for another term. A student who does not meet these requirements would have to successfully appeal to be placed on probation. This appeal must explain why he or she failed to make satisfactory progress and what has changed in their situation that will allow them to make satisfactory progress at the next evaluation as well as detailed information about why the student failed to meet the requirements of the probation period, including what had changed and why the student will be able to meet the terms of the educational plan. Withdrawals - All withdrawals are monitored by the Financial Aid Services. Students who withdraw from courses and reduce their course loads after registration will have their financial aid reduced accordingly. Charges and credits are adjusted according to the College Refund Policy. Federal aid is adjusted according to the Return of Title IV Funds Policy regulations. If you receive federal aid and withdraw or stop attending some or all of your classes, Union County College is required to recalculate your eligibility for all of your financial aid awards. You may be required to return some or all of your federal financial aid if you have not completed at least 60% of the semester. In addition, you may be required to return some or all of your state and federal financial aid if you withdrew or stopped attending some or all of your courses. You are not entitled to any federal or state financial aid for courses that you do not attend. For more information on how withdrawing can affect your financial aid, please visit the Policies section of the Paying for College page of our website. Leave of Absence (LOA) is a federally mandated policy for all students who receive Title IV federal financial assistance (Federal Pell Grants, Federal Direct Subsidized or Unsubsidized Loans, Federal Parent Loans, and Student Educational Opportunity Grants). Under certain conditions (such as personal, military services, illness or health, employment, humanitarian or church service, family responsibilities, and financial obligations) students may request a LOA from the College. A LOA will allow the student’s status to remain as “in school,” making the student eligible for a deferment on student loans during the approved time while not actively registered with the College. However, the specific requirements by which the student agreed to abide at the time any financial aid was accepted will remain in effect (approved students are advised to contact their loan servicer(s) for repayment information and grade period expiration policy). Students’ Federal loans will enter into grace. Federal Direct Student Loans have a six month grace period, and Federal Perkins Loans have a nine month grace period. During a grace period, students are not required to make payment on their federal student loans. If a student returns to school (at least half-time) within the grace period, their federal student loans re-enter into an “in school” status. Students are not required to make payments with this “in school” status. Students will want to contact the lender(s) of any private student loans they may have to determine whether they are required to make any payments when they are not enrolled in classes. The Director of Financial Aid will review the request and either approve, deny, or request additional information within seven (7) business days of receipt. The student will be notified of the decision by email. Once the LOA is approved the student must attend a LOA advisement session provided by one of the College’s Financial Aid Counselors. The student will need to schedule that appointment and attend to complete the LOA request process. You are eligible to receive federal financial aid for only one retake of a previously passed coursed. Remedial coursework prepares a student for study at the postsecondary level. Schools are permitted to count up to one academic year’s worth of remedial courses as eligible for federal financial aid. For the purpose of this limit, that translates into 30 semester hours. Once a student has completed 30 TOTAL semester hours of remedial coursework, any additional hours of remedial courses cannot be included in financial aid eligibility. At Union County College, any courses with a Developmental (DV) designation are considered to be remedial courses, for financial aid purposes. After a student has completed 30 credit hours of Developmental Coursework, any further hours are deducted from the student’s enrollment in a term. A book allowance is offered as an aid to assist students with the cost of textbooks and essential course related supplies and is available for the first three weeks of Fall/Spring semesters, and for the first two weeks of Summer/Mini semesters. If your financial aid award (excluding college work-study or federal work-study) is greater than the tuition and fees charged for the semester, you may be eligible for a book allowance. Students should be financially prepared for out-of-pocket expenditures when their maximum book allowance has been reached. Book allowance purchases are charged against the student’s financial aid. Purchases over the amount of the book allowance are the responsibility of the student. In the event the student’s financial aid award is reduced or canceled, all book allowance purchases are the financial responsibility of the student. Some students may not be eligible to receive a book allowance but may be covered under the book voucher program. For more information, visit the Student Services Center on any of the three campuses. High school graduates who finish within the top 15 percent of their class and meet all other criteria are eligible for this award within two years of the year of graduation. Applicants must first apply for all need-based federal and merit based-state financial aid grants first, such as the Pell Grant, the Tuition Aid Grant (TAG), and Distinguished/Urban Scholars Award. After that, NJ STARS will cover the remaining balance of tuition. Those who qualify will have up to two years from the date of high school graduation to enroll and begin using the NJ STARS scholarship at Union County College. The amount of these state awards is determined by the NJ Higher Education Student Assistance Authority and is indicated on the official Student Eligibility Notice (SEN) sent to students by that agency. The Union County Board of Chosen Freeholders has established a “Freeholder Scholars Program” for Union County residents. The scholarship covers the cost of Union County College tuition and fees for entering or returning students who meet the following criteria. Students applying for the Freeholder Scholars Program must file for federal and state financial aid; the Freeholder Scholars Program award will cover the difference between Union County College tuition and fees and financial aid received up to $1,500. Students are eligible to receive the scholarship for four consecutive fall/spring semesters providing they maintain a 3.0 grade point average at the College. Freeholder scholarships are subject to appropriation of funds by the County of Union. To help defray the cost of tuition, fees, and other education-related expenses, you may be eligible to receive a Union County College scholarship. In support of Union County College’s mission to provide affordable, accessible and quality education, the Union County College Foundation invites students to apply for any of the hundreds of scholarships that the College offers annually. Application forms and information on how and when to apply may be obtained from Owl’s Nest only. After signing in to Owl’s Nest, click the “Online Scholarship Application” in the upper left-hand corner of the screen to apply. Students are urged to complete the applications as soon as possible, as scholarships are awarded on a first-come/ first-served basis. In order to be considered for the scholarships which specify financial need, scholarship applicants must also complete the Free Application for Federal Student Aid (FAFSA). The Union County College Foundation is extremely grateful to those donors whose generosity has made these scholarships possible. A complete listing of the most current scholarships, along with the criteria, may be found on the Foundation’s website: www.uccfoundation.org. Information on establishing an annual or endowed scholarship may be obtained by contacting the Union County College Foundation, 1033 Springfield Avenue, Cranford, New Jersey 07016, (908) 709-7505, foundation@ucc.edu. The Hispanic Law Enforcement Association of Union County, Inc.